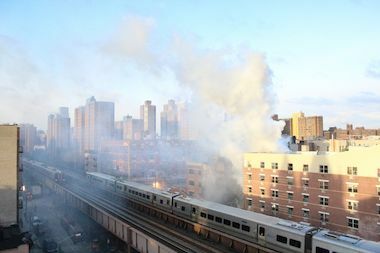 Smoke poured out of the site of a building collapse a morning after it exploded. MANHATTAN — Federal investigators found a leak in the gas pipe that supplied the two buildings that were demolished in an explosion that killed eight people last week, the National Transportation Safety Board said Tuesday. "Tracer gas pumped into the main ... identified a leak adjacent to 1646 Park Avenue, one of the collapsed buildings," the NTSB said in a statement. Authorities have been trying to find the source of the explosion that demolished 1644 and 1646 Park Ave. last week, and suspected the blast was caused when natural gas that escaped from a leaky pipe ignited. Carmen Tanco, 67, Mayumi Nakamura, 34, Rosaurio Barrios, 44, her dauther Rosario Hernandez-Barrios, 21, George Ameado, 44, Alexis "Jordy" Salas, 22, Griselede Camacho, 44, and Andreas Panagopoulos, 44, were killed in the blast. Federal investigators also salvaged two pieces of the 8-inch cast iron and plastic service lines, one measuring 20 feet long and another 3 feet long, from the basement of both buildings and plan to send them to Washington, D.C. for testing, they said. The portion of the cast iron pipe where the leak was detected will be dug up and removed so it too can be sent to Washington for testing, they said. Con Edison was currently working to restore service to buildings in the area, according to the NTSB. "We're continuing to work with the NTSB on this investigation," the utility's spokesman Bob McGee said.